IDT is a leader in wireless power transmitter and receiver solutions for wireless charger applications. Addressing all major standards and technologies, our highly integrated and innovative transmitter ICs are designed for use in wireless charging stations in homes, offices, libraries, stores, public waiting areas, airports and airplane seats. IDT’s receiver ICs are targeted for use in portable devices and accessories. IDT participates in all major industry associations and ecosystems, including the Wireless Power Consortium (WPC), Power Matters Alliance (PMA), Alliance for Wireless Power (A4WP), and the Intel Wireless Charging Technology (WCT). IDT develops solutions for both magnetic induction and magnetic resonance wireless power technologies . About Wireless Charging Technology Wireless charging technology facilitates the transmission of electrical energy from a power source to an electrical load without connecting wires. The technology is especially useful in cases where wires are hazardous, impossible to connect, or simply inconvenient. Today’s wireless chargers come in various physical forms, but are all based on the fundamental principles of electromagnetic coupling. Adhering to one or more industry standards, the challenge to build advanced wireless charging circuits is to maximize efficiency, compatibility, and safety, while minimizing the physical dimensions of the solution. IDT’s industry-leading devices offer all of these qualities, enabling wireless charger and portable device manufacturers to easily and effectively integrate wireless charging technology into their next-generation products. IDT is the industry leader in memory interface devices, offering JEDEC-compliant, Zero-Delay PLL clock drivers (buffer) and registers to meet the tight timing budget requirement of dual in-line memory modules (DIMM) and memory interface applications. IDT is also the industry’s leading supplier of FIFOs and multi-port memories with the most comprehensive and highest-performance products available. The IDT FIFO portfolio includes more than 350 synchronous, asynchronous and bi-directional products to help designers solve interchip communications protocol problems, such as rate matching, buffering and bus matching. IDT’s Multi-Port Memory portfolio contains more than 150 types of asynchronous and synchronous dual-ports, four-ports and bank-switchable dual-ports. With over three decades of SRAM experience, IDT offers a broad line of high-speed, industry-standard SRAMs that are used in communications and industrial markets. 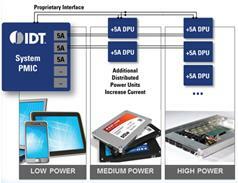 IDT also offers high-performance, low-voltage standard logic ICs and bus switch logic ICs.